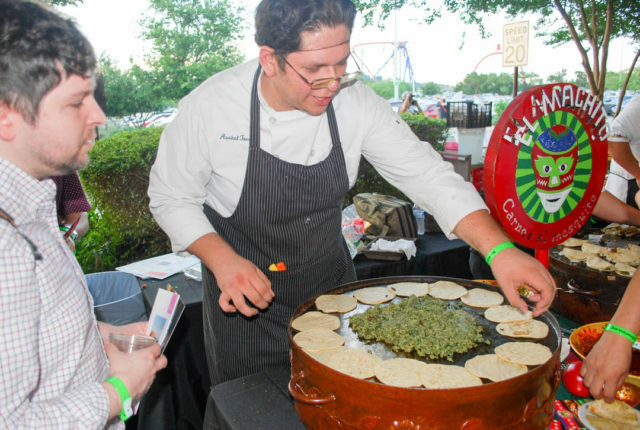 For those who’ve fallen in love with South Texas’ bounty of Mexican (and Tex-Mex) flavors, Culinaria’s “Best of Mexico” was pure bliss. 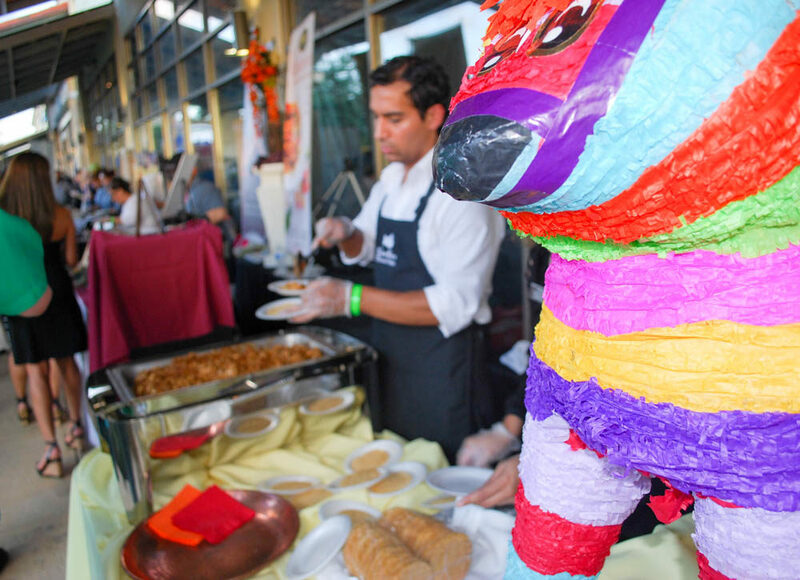 Held at The Shops at La Cantera in May, the event boasted dishes from the finest Mexican and Latin restaurants in San Antonio. If you missed it this year, don’t make the same mistake twice. This is for the sake of taste buds and all that is delicious in this world. After pre-gaming nearby at the fantastic Bar Louie, my photographically-inclined friend and I headed up the stairs to receive some official wristbands. The event was relocated at the last minute in a bid to avoid thunderstorms that had persisted throughout the day. Not to fear, there was just enough space for the hordes of patrons getting their respective fills. 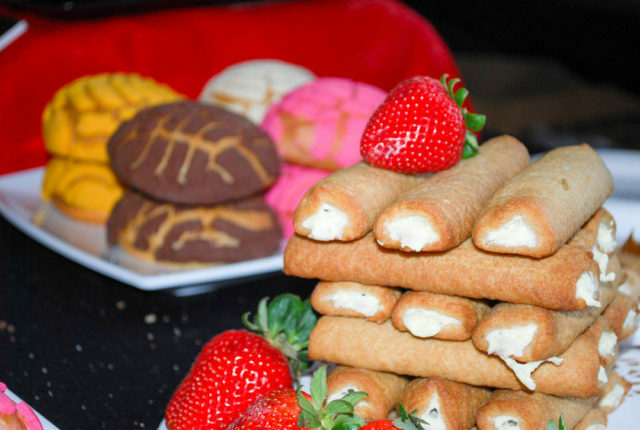 Mexican pastries at Culinaria’s Best of Mexico event. Photo by Eddie Ruiz Healy. We were greeted by a lineup of appetizers that included ceviche and your standard chips and guacamole combo before bearing witness to the main event. A massive hallway opened up to reveal the epic assortment of restaurants represented from across the city. My cohort and I were recommended the Margarita Lounge, and that wasn’t to be missed, either. It was there we discovered the “Bloody Shiner”—a concoction comprised of Jalapeño Moonshine, Zing Zang Bloody Mary Mix, lime and Tobasco Sauce. The food, however, was the centerpiece of the evening. Here’s a run-down of everything we tried, along with the predictable anecdotes about just how good it was. Many thanks to Eddie Ruiz Healy for capturing the food in all its photographic grandeur. It takes a pro to make styrofoam plates look classy. 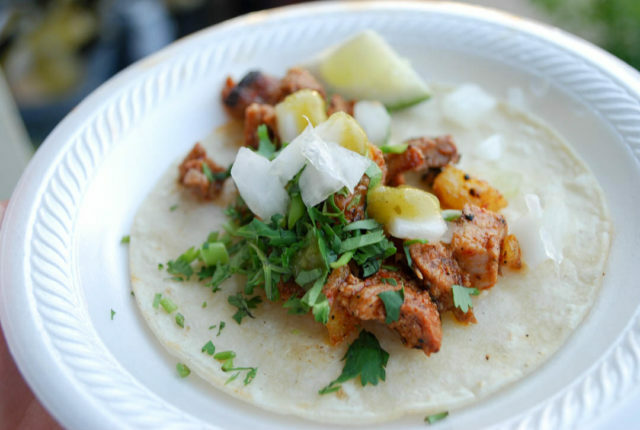 More tacos al pastor, please. Good as these tasted, the real treat was just seeing the massive spread of al pastor—it was a sight to behold. 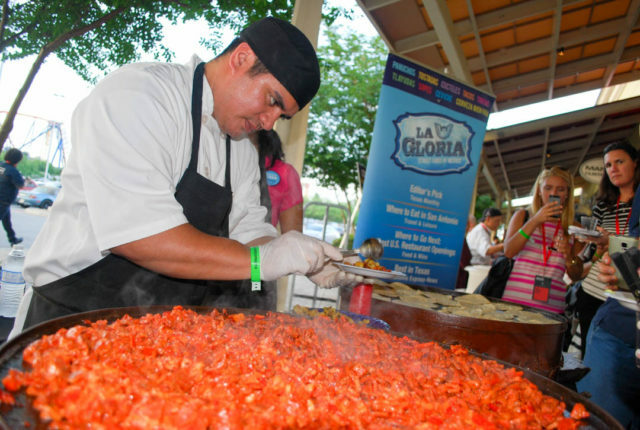 Chef Johnny Hernandez has emerged as something of a luminary in these parts, and La Gloria is one of the reasons why. This place is good—and unique. Tacos al pastor from La Gloria. Photo by Eddie Ruiz Healy. This was my first encounter with El Mirador, and it was a good one. The tacos al pastor had a nice citrus perk to them and kept the porky goodness of the evening going without interruption. They weren’t the only tacos al pastor of the night, but they were memorable in their own right. Trying El Mirador has been added to the to-do list. Tacos al pastor from El Mirador. Photo by Eddie Ruiz Healy. One of the most popular Tex-Mex destinations, Paloma Blanca is tucked away off Broadway and features a picturesque outdoor patio. The Alamo Heights institution didn’t disappoint with its shredded chicken mole served atop a tostada and accented with a little fresh cheese. The chicken was subtly delicious and a nice departure an evening that was absolutely dominated by pork. There’s good reason Paloma Blanca has become one of the more reliable dining destinations in the city. Urban Taco may be a chain, but that’s not always a bad thing. 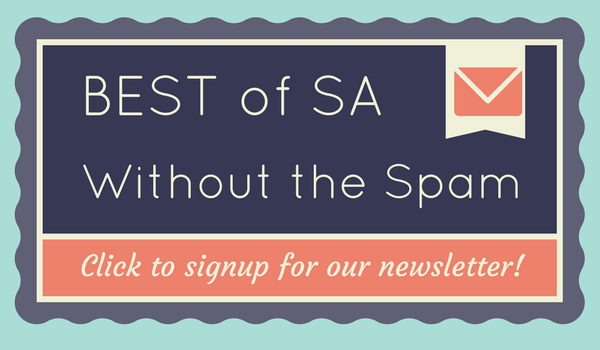 With just one location in San Antonio, it’s not as though there’s one on every block. This place does things a little differently, and that’s good. The chicken flautas weren’t in and of themselves revolutionary, but the jalapeño-zucchini sauce came out of left field in the best-possible way. You’ll want to put on everything—especially deliciously fried corn tubes filled with chicken. 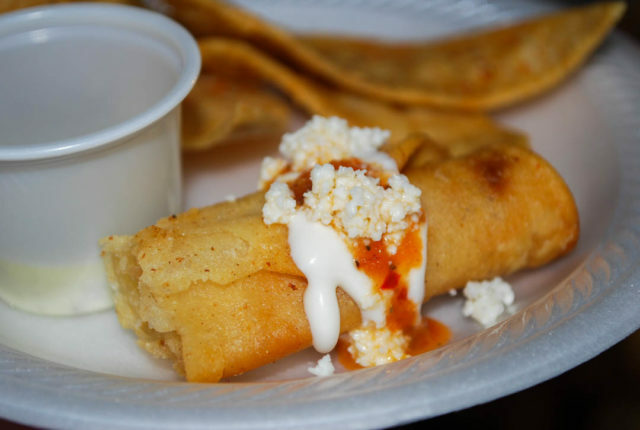 Flautas from Urban Taco. Photo by Eddie Ruiz Healy. I know this is about the food and all, and—don’t get me wrong—the tacos de cochinita pibil were fantastic. But any mention of La Fogata would be remiss without bringing attention to this place’s amazingly good margaritas. No complaints about the consistently good food, but you want to come here for the tequila and not-too-crazy sweet-and-sour. In a city with no shortage of great margaritas, this one is one of the very best. The other Johnny Hernandez creation is just as solid. You probably haven’t had a quesadilla like this one. The chorizo verde inside it was exquisite—and definitely leaves you wanting more. It’s made with pork, roasted poblano peppers, cilantro and pumpkin seeds. Add it all up, and you have some unusually good chorizo on your hands. Chorizo verde quesadillas from El Machito. Photo by Eddie Ruiz Healy. Located on the Pearl Brewery end of Broadway, Tacos and Tequila is officially here to spice things up. Their pulled pork was a joy to behold visually—and it was even better going down thanks to some outstanding habanero barbecue sauce. It was admittedly a little more Tex than Mex, but that shouldn’t be held against it in the flavor department. Pulled pork from Tacos and Tequila. Photo by Eddie Ruiz Healy. 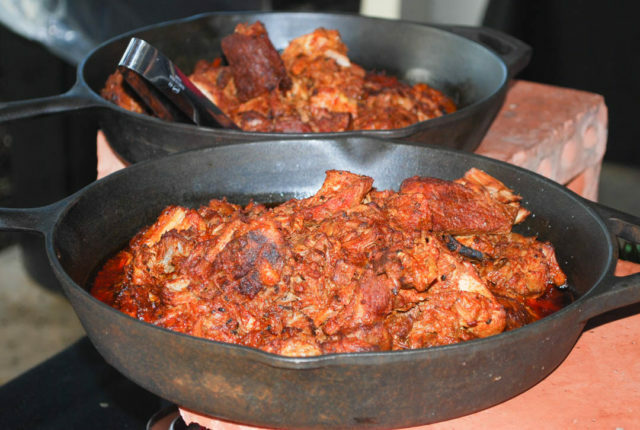 Cocina Heritage offered a couple of different varieties of their cochinita pibil. I tried the one with habanero sauce, because of course. Plenty moist and plenty flavorful, this was the evening’s first pork dish—but far from its last. Still, it stands out as one of the better attempts and leaves me genuinely curious about the rest of the menu at Cocina Heritage. 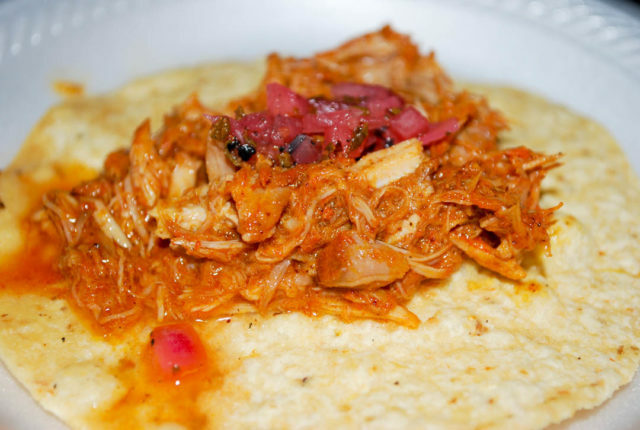 Cochinita Pibil from Cocina Heritage. Photo by Eddie Ruiz Healy. Okay, so it wasn’t your traditional Mexican food, but we weren’t complaining. 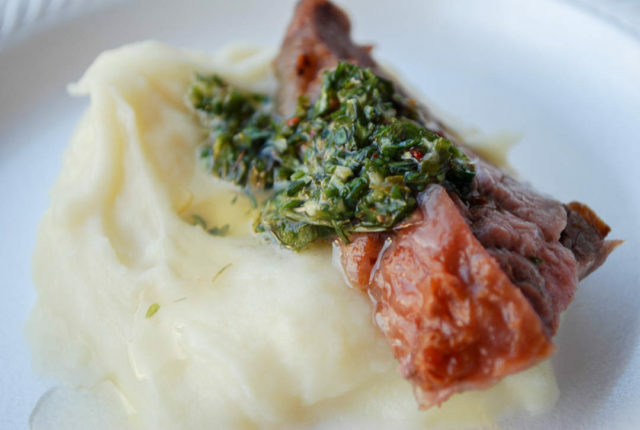 A perfectly tender bite of flank steak was accompanied by silky mashed potatoes and topped off with a dollop of chimichurri sauce. Texas de Brazil is all about the meat and this dish was no exception. For those insatiable carnivore cravings, there may be no better destination in town. Flank steak from Texas de Brazil. Photo by Eddie Ruiz Healy. It was definitely more Tuscan than Mexican, but hey, who’s keeping track? Not us. The Pasta Fra Diavolo (with chicken) was fantastic. We didn’t want to fill up on starchy pasta so early into the tasting, but this was too good to put down. The pasta fundamentals were all on point here, but the lobster butter and red pepper flakes take this Italian classic to another level. Everything was tasty. All of it. Not one miss in all the dishes we tried. And the scary thing is that this was just a tiny sample of all the amazing Mexican food in this city. It’s a rare occasion that you get to try a little of everything, and that’s the real attraction here. There’s music. There’s beer and margaritas. There’s a great time to be had. But most importantly, there’s the food, the recipes, the culture that’s inspired them over the years. That, my friends, is a taste of Mexico you definitely want to try the next time Culinaria rolls around. 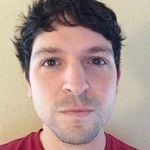 Stephen is a San Antonio native and freelance writer who's covered the NBA for Bleacher Report and loves good food almost as much as the Spurs.